Over half of the American population drinks coffee on a daily basis. Since the coffee plant was discovered thousands of years ago in Ethiopia, hundreds of millions of people have fallen in love with their own particular taste for specially-blended caffeine concoctions. There are thousands of espresso machines that you could choose from, though not all of them are created equally. 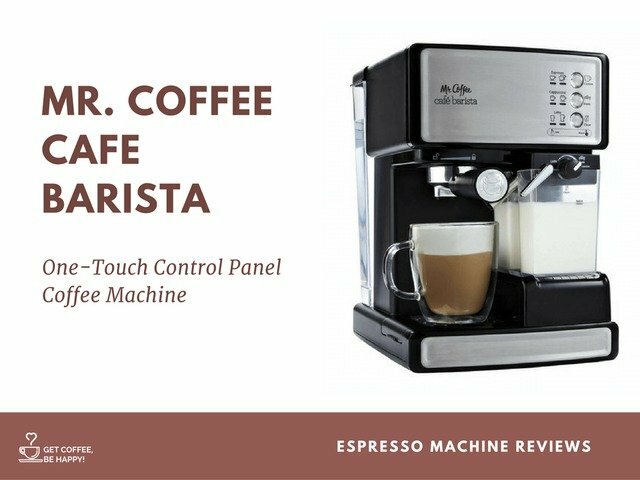 The Mr Coffee Cafe Barista is one of the models that has been rated as being among the more technologically sophisticated choices on the market for you and all other coffee aficionados of the world. The Cafe Barista is a solid model that should satisfy you perfectly as long as it remains in top form. The features are convenient and it operates swiftly, you may need to give it regular maintenance to keep its performance from slipping down the line. This Espresso Machine by Mr Coffee is a solid choice if you’re a beginning or intermediate-level brewer who wants a slight taste of more advanced brewing customization features. The Cafe Barista has been designed to give you the ability to create drinks at the same level of customization and efficiency as a professional barista. 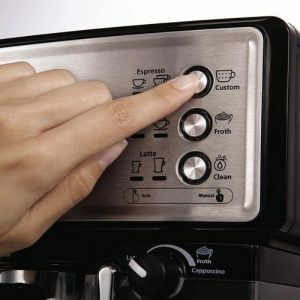 Your coffee machine can be operated with a single or double touch of a button, corresponding with single or double servings of cappuccinos, espressos, and lattes. There are 15 different bars of pressure that you can choose between in order to make a beverage that fully meets your preferences. With the milk container integrated into the body, you can brew lattes and cappuccinos with generous amounts of froth relatively easily. To start the brewing process, simply add your grounds to the portafilter, fill the milk reservoir to your specifications, and choose any one of three different brewing programs. After specifying the preferences and pressing the button, the Mr Coffee Cafe Barista takes care of the rest without the need for any additional extensive involvement. In the brewing process, you can choose between either the milk froth mode or the manual espresso mode. The milk reservoir can be detached and placed elsewhere; this makes the cleaning process slightly more convenient. In addition to the milk reservoir being easily removable, the drip tray can be removed as well. The milk reservoir and drip tray are both dishwasher safe. The maximum capacity for the removable water reservoir is 55 ounces in total, which means that you can have multiple brewing sessions before it is necessary to refill the water repeatedly. Be advised that the height of the sliding cup platform is made to accommodate smaller cups, so your larger cups may not be quite as easily accommodated. Included with this Espresso Maker is a book of recipes. The book of recipes has instructions for 10 different beverages that you can choose to create at your leisure, though there’s always room for your own innovations. The product can be purchased in one of three different color variations: stainless steel, white, and red. The dimensions are 12 x 14 x 12.2”, and it weighs 9 pounds. 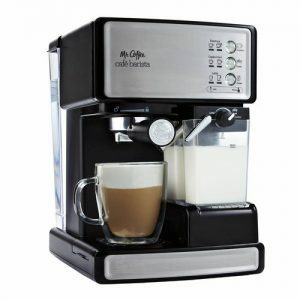 The EMCP1000 features an automatic milk frother, a removable milk reservoir, and an adjustable cup tray for quickly and easily setting your preferred elevation. The unit also features a one-touch control panel that can be used for either single or double shot brews, a removable water reservoir, and a drip catcher. Additional convenient features include a measuring scoop, tamper, and both a single shot and double shot filter. If you’re in the market for a satisfyingly inclusive range of features for customizable coffee brewing at an affordable price, then this product should be right up your alley. The removable reservoirs and single-touch functionality make it relatively easy to create a diverse range of beverages with minimal effort, and cleanup is easy as well. The only drawback is that its maintenance must be consistent and attentive as it grows older, lest the performance begins to dwindle. 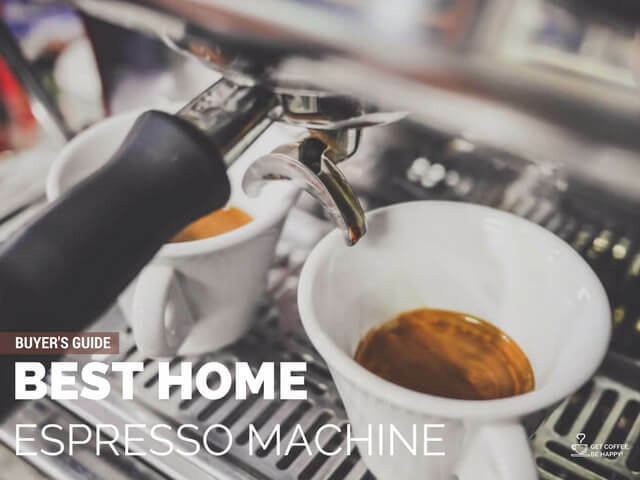 Overall, whether you’re an experienced barista or a hobbyist, you should be perfectly satisfied by what this espresso machine has to offer.